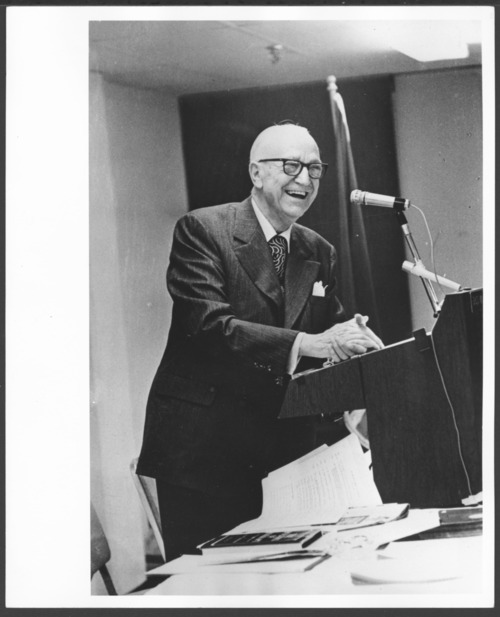 This photograph shows Dr. Karl Menninger at a podium. Dr. Karl, his father Dr. C.F., and his brother, Dr. William, formed a group psychiatry practice in 1919 and in 1925, with the purchase of a farm house in Topeka, Kansas, the Menninger Clinic was established. Their philosophy was that mental illness could be treated with an integrated medical, psychodynamic, and developmental approach for the total health of patients. Dr. Karl was known in many circles as the founding father of psychiatry; he produced 15 books that influenced psychiatry over the years. Menninger was a key training hospital and became the largest training center in the country after World War II.